Has the Sony Reader Wi-Fi Actually Got a Shot? 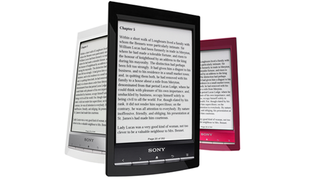 Sony may have been the first major electronics manufacturer to bring ebook readers to the US, but a series of unfortunate products saw them cede the race to Kindle and Nook. The PRS-T1, though, could be Sony's comeback kid. The six-inch E-ink ebook reader is the world's lightest at that size, and its touchscreen display means you can annotate pages on the screen using either your finger or included stylus (the finger may be clumsier, but it feels more magical). The 2GB internal memory is good for 1,200 ebooks, while a microSD slot allows for expansion up to 32GB. Battery life: a month, if you read a half hour every day. But most importantly? Sony finally put Wi-Fi in an ebook reader. No, really. They hadn't yet. Those are features you can find by varying degrees in the Nook Simple Touch, yes, or the latest Kindle. But at least it competes! And looks a little, well, angular and maybe cold but hey some people are into that. That is, after all, how books look.